If you're constantly being told that you need to grow up or you need to stop being immature then you need to take a look at the Pentax Optio RS1500. Sure, it has a sensible 14 megapixel sensor, 4x optical zoom starting from 27.5mm and a 3 inch monitor. But look at the front covers. You can change them. 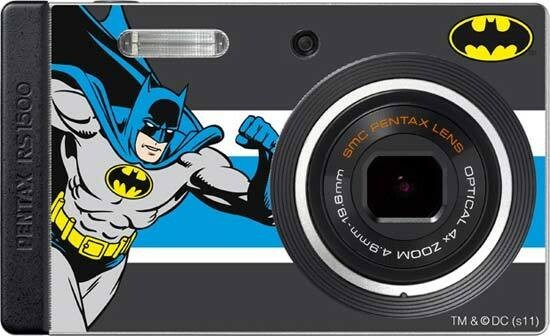 And with the Super Heroes pack, you can have Batman on the front of your camera. It's like being a kid again, except you're not. We already have a reputation for ripping open our shirts so this review will provide the perfect excuse. Available in a silver or white base colour, the Pentax Optio RS1500 is available for £89.99 / $119.95. Without the advance knowledge that the Pentax Optio RS1500 has removable front covers, it looks pretty bland. The white front sports the range name "Optio" branded into it and is covered by a clear plastic sheet. A plastic ring surrounds the SMC Pentax lens which starts at a nice wide-angle 27.5mm and zooms out to a respectable 110mm. Then we find out that the plastic ring can be pulled off and the plastic sheet removed. Inside the box is a plastic resealable bag with rectangular pieces of paper in it that have a circle and oval cut out for the lens and flash. These pieces of paper are templates that have unique designs on that can be slid underneath the clear plastic to give the front of the camera some colour and jazz. There are two kits available. The first is the standard Pentax RS1500 kit that has 10 "skins" with designs such as carbon fibre and an old camera. The second one is the DC Comics collector pack that has an additional 7 skins featuring cartoon super hero favourites such as Batman, Superman, The Green Lantern, The Joker, Wonder Woman, Catwoman and Flash. This is great for all you big kids out there that grew up with these comics. Even if, like us, you weren't a big comic reader, the characters are so well known that they will easily bring a smile to anyone's face that sees the camera as you use it. To use a skin, simply tuck it under the black plastic edge on the right, place the clear plastic cover over it and attach the bendy plastic ring to the lens bezel. That's one issue that is evident straight away: the Pentax Optio RS1500 is made solely of plastic which will affect how robust the camera is. In fact, it's pretty weird to see an all plastic camera these days, so it could be possible that Pentax designed it this way on purpose to fit the retro feel that the skins will give. On the top of the RS1500, there's a small power button indicated by a red dot in it's centre and the shutter release button sitting next to it. While they are in close proximity to one another as we used the camera, we never had a problem with accidentally turning it off. A small, round indentation at the left of the top plate is used as a grip for the index finger. Moving onto the back, the 3 inch screen takes over most of the area. A small zoom rocking button is in the top left corner which operates the zoom at a reasonable rate. While the zoom may not be the fastest we've seen, the start up time is admirable at just under a second and we managed to get the camera switched on and taking a picture in just over 2 seconds. There are two menu options on the RS1500 which is typical of Pentax digital compact cameras. The mode button on the white navigational pad accesses the mode that you want to put the camera in, be it: program, auto, scene modes such as landscape, sports or fireworks among others and video. Simply press the mode button, highlight the mode you want to try by using the white navigational pad and press the OK button. The main menu has its own dedicated button and the menu uses the Pentax design that all their compacts use. The menu is split into two sections for shooting options and set-up. The recording menu allows you to change resolution, white balance, focusing, exposure compensation and ISO as well as less used features such as shadow correction and digital blur removal which are found on the second page. As with all Pentax digital cameras, the Optio RS1500 has a green button. It's found in the bottom right corner on the back of the camera and is the fail-safe button for the technophobe. Pressing that button takes the camera into an uber auto mode that doesn't allow any changes to the camera in the recording menu at all. It does still give access to the set up menu which allows you to change the date & time, change world time, rename folders, format the card as well as other core operation functions of the camera. It also gives ultra big text and only the most basic of information. The great news for the more advanced user is that in the main menu, you can change what the green button does for you. It can be designated as a direct access for ISO, video , exposure compensation or resolution if you don't need the green mode. Given the massive amount of plastic that's gone into the build of the RS1500, we weren't expecting to see a metal tripod bush and we were correct. One area that we're surprised about and a little dismayed is the battery door. It's very flimsy, very bendy and has a tendency to come open while shooting. Under the door is the rechargeable lithium ion battery and SD memory card slot. The camera takes both SD and SDHC cards and it's unusual to see that it doesn't take the new SDXC card type. Going into the playback menu, the RS1500 has a good amount of things you can do. There are 14 options in the editing menu which is accessed by pressing down on the navigational pad. It's possible to create a slide-show, rotate the picture, add digital effects, crop the picture, edit video, protect the picture and a handy option for copying pictures on the built-in memory to an SD card. Aside from the skins in the box, there's also five blank templates for your own creations which can be arranged and printed via www.pentax.co.uk/chameleon/. A Green Lantern soft pouch and 4Gb memory card are also found in the super hero kit but they weren't in the box that we received in the office. There's the usual paraphernalia found in camera boxes along with a quick start guide so big it could be a full size manual. The reason for the size of it is because of the sheer amount of languages it's been printed in. The full manual is available on a CD enclosed and another CD has MediaImpression 3.0 for Windows and 2.1 for Mac users. What the Pentax Optio RS1500 lacks in build quality and overall styling it makes up for in fun thanks to the skins that basically hide the lack lustre design. We're unsure about the amount of plastic that the camera is made up of. We don't think it will last very long in the real world but at less than £100 to replace it, does it really matter? The Pentax Optio RS1500 is fast when it's focusing and especially when it's being switched on. In fact, the slowest part of the camera is the focusing and even that's not too bad. Areas we're unimpressed with include the battery door because it's so flimsy and kept popping open on us. We also found that we had trouble with the plastic ring on the front of the camera. We only managed to fix it flush to the body once. The rest of the time, parts of it were sticking up.